Hello everyone! In this week’s episode, Eric and Robbie discuss the growth of cons and nerd culture, and departure of Paul Jenkins from Marvel and DC! They also review a fresh batch of this week’s comics, and take a look at The Coffin in Classic Breakdown! With a super special debut of Rantin’ and Ravin’ with Alan Moore! 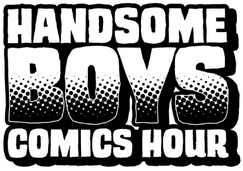 This entry was posted in Episodes and tagged alan moore, archer and armstrong, astro city, avengers, comic books, comics, dishonored, doom, earth 2, handsome boys comics hour, mike huddleston, ouya, phil hester, random character generator, the coffin, winter soldier on June 11, 2013 by handsomeboyscomicshour.